Le Village is where old-world charm has a hip, fresh attitude. Located in Montmartre, one of Paris's most popular and authentic areas, we provide travellers with the service and comfort of a hotel at budget prices. Montmartre is one of Paris's most popular districts for a few reasons: itâ€™s close to famous tourist sites like Sacre Coeur and the Moulin Rouge and is full of bars, bistros and some of the best nightlife Paris has to offer. We're very close to the metro so getting to anywhere else in Paris easy and cheap.Stay here and youâ€™ll be in a fantastic area.All of our rooms are equipped with air conditioning and their own shower, toilet, sink and telephone and include free linen and blankets. Towels can be rented for just â‚¬1. Ask for the rooms with an amazing view on the SacrÃ© Coeur Basilica! Of course we canâ€™t promise you'll get one but it doesnâ€™t hurt to ask. Don't worry if you don't get one. Everyone can enjoy the view from our terrace.Guests can enjoy free high-speed Wi-Fi, free breakfast and free day luggage storage before check-in and after check-out.Reception is open 24hrs and our friendly staff will gladly help you get the most out of the area and to make reservations for Disney, the Moulin Rouge and much more. The hostel is cleaned daily and thereâ€™s no curfew. Our cafe is open until 2am and itâ€™s a great place to meet other travellers and make new friends or just chill. 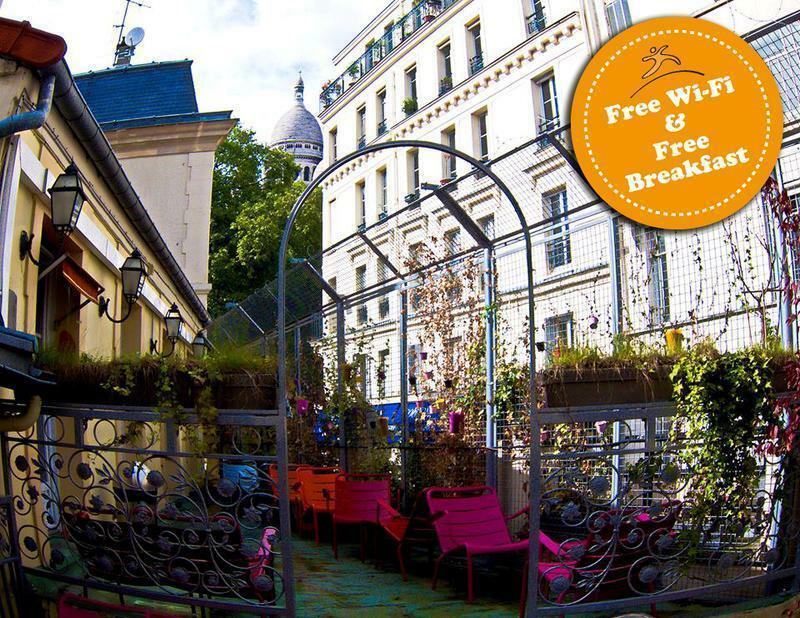 We have free maps and free major mobile phone rechargers at your disposal.Our terrace has an incredible view of the SacrÃ© Coeur, while the refurbished kitchen has everything you need to prepare your meals with friends. You can also exchange books in our library.Weâ€™re located close to the post office (for that postcard you promised Mum ! ), the metro, supermarkets, bakeries (Parisian are world-famous), Laundromats, restaurants and clubs.We will soon be opening a pub and on-site laundry facilities!The management and staff of Le Village strive to make your Paris sojourn enjoyable and comfortable. Donâ€™t forget to bring humour and a smile ;)Please note that guests under the age of 18 years must be accompanied by a parent or guardian with written authorisation from parents.If our hostel is full, we suggest that you try the other HipHopHostels located nearby. These include Le Regent, Vintage Hostel, Caulaincourt Hostel, Woodstock Hostel and Plug-Inn. Our other hostels and budget hotels include Oops! and Youth & Happy in the Latin Quarter; 3 Ducks and Aloha over near the Eiffel Tower, and Absolute Hotel, which is located on Canal St. Martin. Each of us is in the HipHopHostels family (code for: we all have the same owners). All HipHopHostels are consistent in that we have friendly and knowledgeable staff, we are all located in convenient and authentic areas of Paris and offer great value for the money. We are not cookie-cutter in that we are all the same. Like any family we all have our own personalities but we are sure a HipHopHostel has something for every type of budget traveller.Please read our Things to Note below before booking. From Anvers Metro Stop (line 2):Walk up rue Steinkerque on your right - facing the Sacre Coeur basilica for one block and turn right on rue d'Orsel. We are at number 20, on your left hand side.From Gare du Nord:Walk out the train station take a right and walk up rue de Dunkerque to Rochechouart or take the metro. From Charles de Gaulle Airport:Take RER B direct to Gare du nord (30min) walk out the train Station on the left (then follow information).from Orly Airport:Take the Orlyval then RER B direction Paris, exit at Gare du Nord.From Beauvais Airport:Take the Bus to Porte Maillot then take Metro line 1 and change at Charles de Gaulle Etoile stop to line 2 to Anvers.We recommend that you print out this page and bring it with you to help you find your way.